CAREWARE-ERP: Are you looking for an Inexpensive, Easy & Fast to implement Manufacturing Software? Are you looking for an Inexpensive, Easy & Fast to implement Manufacturing Software? Until recently, organizations needing manufacturing systems had few choices; you installed an expensive, complex enterprise resource planning (ERP) software system, and then you spend eight months to a year learning and trying to make it run. With productivity drops and frustration sets-in and users get demotivated you are back to square one. 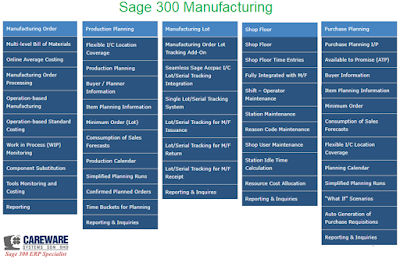 Sage 300 Manufacturing is designed for small to medium-sized manufacturing firms. The system is simple yet powerful, that users can follow logically which enables an efficient manufacturing operation flow covering material purchase, processing manufacturing orders, work in progress, routing cost calculation, material consumption, material scrap and item substitution and order closeout and more. The design of Sage 300 Manufacturing System is conceptualized to fully accommodate users’ business processes needs and expectations.